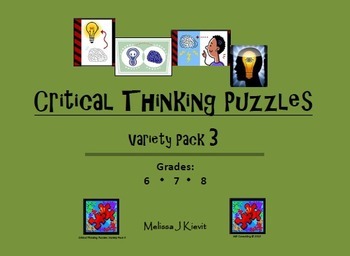 Critical Thinking Puzzles: Variety Pack 3 for Middle Schoolers: Four pages of fun puzzles guaranteed to help your learners become better critical thinkers. 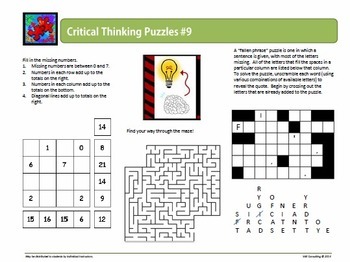 Two pages include Fun with Numbers Puzzles, Mazes (spatial relations), and Fallen Phrase Puzzles. 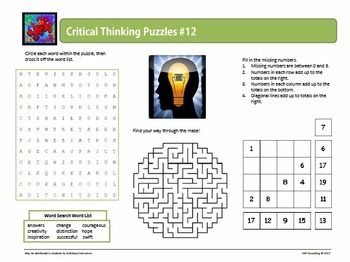 Two pages include Fun with Numbers Puzzles, Mazes (spatial relations), and Word Searches.